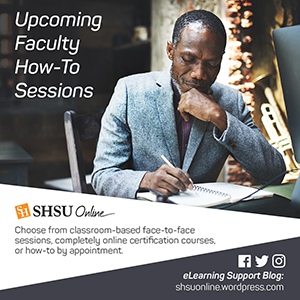 SHSU Online is pleased to offer a number of faculty development opportunities via different avenues for November 2017. SHSU Online will need to apply a critical update to Blackboard on Sat, Sept 2, during Labor Day weekend. As a result, you will not be able to log into Blackboard for approximately 12 hours from 5:30 a.m. to 5:30 p.m. CST. As is customary, we will post announcements on the Blackboard landing page, in every Blackboard course, as well as on the SHSU Online website. The SHSU Online Support Desk will be available to answer any inquiries. On Sunday, August 13, Blackboard was updated to a more recent version(Q2 2017). Though the majority of Blackboard will operate the same as before the update, there are some important new features that we would like to highlight. Below you will find descriptions for each new feature as well as links to thorough documentation on each. Instructors can keep track of all student submissions, regardless of whether the attempt or assignment is deleted or the submission history is changed. A submission receipt is captured at the time of submission and includes information such as attached file information, date, time, etc. This feature provides evidence for academic disputes, giving students assurance about their work. Blackboard Instructor is a mobile app that enables instructors to view course content, connect with students in discussions, and interact with classes in Blackboard Collaborate. The app is available on iOS and Android mobile devices. Students can attach files and submit assignments from their personal Dropbox accounts using this new cloud service integration. In face-to-face courses, students have the luxury of benefiting from questions asked while in the classroom or the ability to stop by your office to discuss an issue they might be having. In both cases they get the chance to interact with you and possibly some of their fellow classmates. Sometimes, students find it challenging to find that same connection in an online, hybrid or web-enhanced environment. The good news is that with Blackboard, you can create a virtual space where your students can experience the same kind of connection and feedback they receive in their brick-and-mortar classes. Placing a photo of yourself, your contact information and a little biographical info can go a long way toward helping your student see you as a person and not some synthetic-robot version of yourself. If you want to go the extra mile, replace the photo with a quick Intro or Welcome video that can bring out your personality and help the students get to know you. 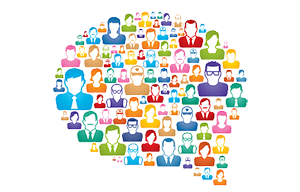 By subscribing to your own virtual office discussion forum you will receive prompts when questions are posted. These prompts will help you engage with your students in a timely fashion and make the students feel like you are in the course. Let’s face it, we all “misplace” e-mail. For some of us, our inbox receives a hundred new messages or more each day. Why not make life easier on you and your students by reserving course-oriented email for things of a personal or private nature. Have your students post general course questions to the virtual office discussion forum. When you answer questions via e-mail the only people that see that correspondence are you and the student. If a question is answered in a public space like the virtual office, everyone benefits. You may have to use the first week of the course as a “training week” where you ensure you point your students to the virtual office for answers to course questions. Make it a requirement in your syllabus, an expectation on your course expectations page and a question on your Syllabus quiz to ensure students know where to go. BONUS: The virtual office builds a course FAQ over the course of a semester that you can then use as part of your next semester’s course. The more time a student is spending in your course, the more connected they are to what is happening. When your students establish the habit of checking the course regularly, they will be more engaged and more successful. Encouraging your students to check the virtual office daily will get them in your course and connect them to the information and activities they need to conquer course objectives. July always seems like it should be a slow month. It is smack dab in the middle of the summer and the heat alone makes you want to take a breath and find some shade. 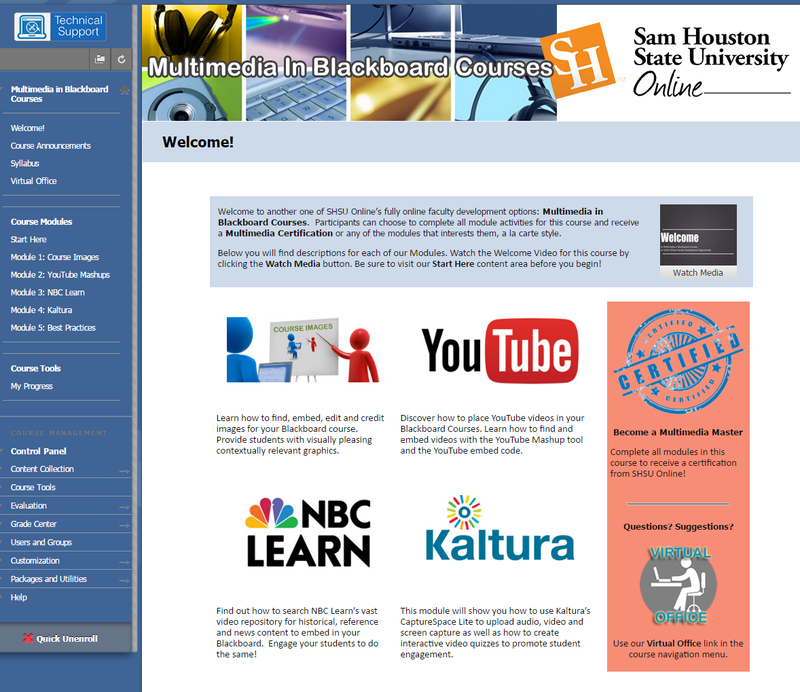 July 2017 however, is jam-packed with opportunities and information that can benefit any Blackboard instructor at Sam Houston State University. *Gain certification upon course completion. Rubrics lets students know what they need in order to succeed. This full blog post provides more detail into each of the benefits listed above, but in addition to the post, we have now created a showcase of Rubrics for you to preview and download for direct import into your Blackboard course(s). Numerous pre-built rubrics are now available for you to use ‘as-is’ or edit to fit your needs! We will continue to add additional Rubrics to the repository. If there is a specific type of Rubric you’re looking for, don’t hesitate to let us know! To find this new resource and to download the ready-made rubrics for import into your Blackboard courses, visit the Faculty Central tab in Blackboard and Select Bb Resources. This recent addition to our certification lineup offers attendees the chance to learn how to employ the multimedia tools that Blackboard has in its tool belt. This course provides the Blackboard instructor with the knowledge and skills in both the acquisition and implementation of multimedia for online/face-to-face and hybrid courses. Technologies and best practices are examined in the context of student engagement and success. Successful completion of this course awards the Multimedia Master certification. Communication and collaboration are key facets to this online certification course. In this course, we will further explore some of the communication and collaboration tools Blackboard Learn has to offer. You will have ample opportunity to communicate, gain feedback and share ideas with your colleagues’ using of the tools. Successful completion of this course awards the Online Community Organizer certification. We have posted previously on the importance of showing students what success looks like in an eLearning environment like Blackboard. Whether via a rubric or by the example of a previous student submission, letting students see how they can be successful with an assignment or activity in your course is generally a good idea. This post will help you discover how to utilize a tool that your students will use in their activities by employing it to display course content or provide course communication. That’s right, you are getting two for the price of one! The wiki tool can be the most rewarding/frustrating tool in your arsenal of activities that you have in Blackboard. Providing students with instructions on how to use the tool is definitely important, but many times they don’t end up using it the way you intended. This may be because they didn’t have an example or the 1 page example didn’t really show how a completed wiki should look. Example: Use a wiki to display course topic or content. Leave one page with places for your student to add their own text to the wiki demonstrating how a wiki should work in practice. In today’s day and age it easy to make the assumption that all students know how to use a blog or are familiar with journaling due to social media. However, this is generally not the case as most social media posts are micro-blogs (very short 126 characters or less) and full of emojis, text-speak and hashtags. Example: Use a Course Blog to summarize the week/topic/module, provide commentary on student performance and provide a look into the next week/unit/topic. This example allows you to demonstrate how a blog works and allows you to communicate important news and information to your students. Allows for commentary to point out important details about the course content. Gives students a preview/intro into the next unit. Be sure to use multimedia so that students see what the blog can do. *Use other communication tools in your course (announcements, e-mails, calendar entries) to remind students to check the blog. Be sure to encourage students to comment on your blog posts (a few bonus points for your top 3 commenters across a semester). Both of these activities will give your students a good idea about how they can use these tools to complete the activities/assignments that you have placed in your course. This strategy works with multiple types of tools/activities in and outside of Blackboard. Things like VoiceThread, GoogleDocs, course hashtags and many others are easy to pair with the “Seeing is Believing” idea. Hopefully, by employing these types of strategies in your Blackboard courses, you can reduce student anxiety and increase student success! SHSU Online is pleased to offer a number of faculty development opportunities via different avenues for May 2017.